Correspondent Jessica Williams mocked the "Obamacare" frenzy. Jon Stewart and correspondent Jessica Williams told the political and legal pundits to cool it on Wednesday's show. On Wednesday's edition of "The Daily Show," Jon Stewart slammed the rampant speculation over the Supreme Court's ruling on the Obama administration's 2010 health care law—a.k.a., "Obamacare." The announcement, which is slated for Thursday morning, has stirred up a frenzy of conjecture on cable news networks. According to correspondent Jessica Williams, though, everybody needs to zip it until the verdict is actually announced. Stewart asked Williams, who was stationed "live" from the steps of the Supreme Court building, which way the justices were "leaning." "Leaning? I'm pretty sure they're horizontal. As in sleeping," Williams said. "Because it's nighttime. And that's what you do when you're not stuck outside an empty building." Stewart then peppered Williams with absurd speculative questions about the political and legal ramifications of the as-yet-unknown decision. "You need to calm the [expletive] down!" Williams responded. "We'll know in less than twelve hours!" 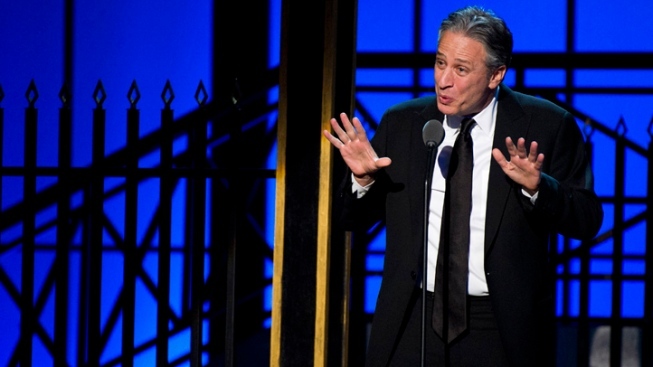 But Stewart, mocking the feverish tone of many of Fox News' and MSNBC's talking-heads, persisted in his line of questing. Finally, Williams relented: "Chief Justice John Roberts just announced a 7-2 decision—that you need to calm the [expletive] down!"